As a SEO Manager you need to be creating Monthly SEO Reports. This is an updated version of the main elements that should be included in the Monthly SEO report template. 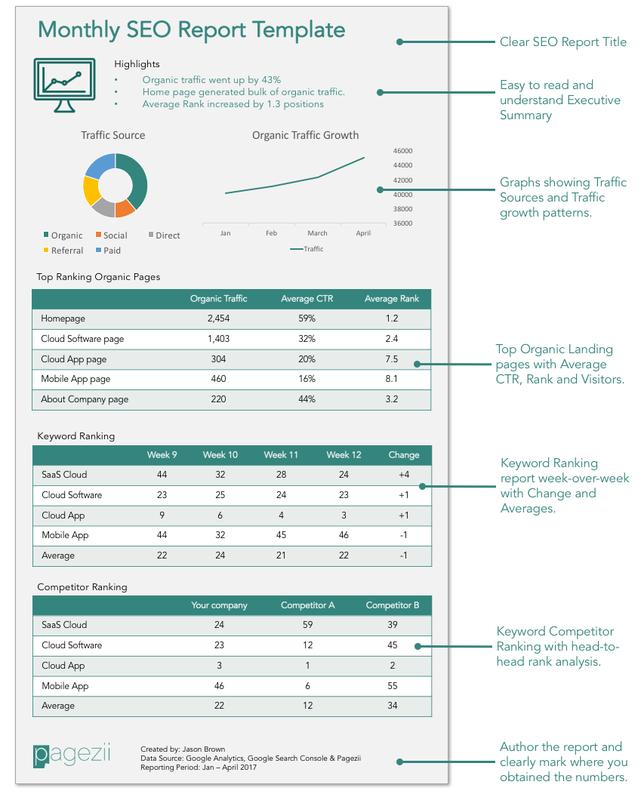 To help you get started with your reports, download the SEO Keyword Ranking Template. Upper Management: The CMO is interested in the cost of lead-aqusition. Organic traffic is a key component of any cost-effective customer acquisition program. Monthly SEO reports help pinpoint success and areas of concern. Digital Marketing Team: The digital marketing team works together using many different channels including Paid Search, Social, Content and referral programs. Sharing SEO metrics is important to making sure the overall digital marketing strategy is working properly. SEO Team: From a tactical point-of-view, the SEO team needs to know what content needs to be optimized and a regular report helps keep the SEO effort moving smoothly. What goes inside a monthly SEO Report? Traffic Sources: Describe how visitors are finding your content – from Organic channels, Social Media, Direct, Referral sites or Paid Searches. Organic Traffic Growth: Plot how organic traffic is changing over-time. Preferably display the numbers with a line-graph over a period of time (e.g. the last two quarters). Top SEO Content: Show the important pages that drive the most organic traffic. You can break it down into top folders if you’ve an Enterprise website. Keyword Ranking: Also show the keywords that deliver the most business value to your organization. Show a week-to-week- or a month-to-month rank for the keywords. It’s a good idea to average out the changes so that you can easily spot any patterns. Competitor Ranking: And finally don’t forget to include a competitive rank profile. Get a list of your direct competitors and see how well they rank for the keywords you track. This is a great way to showcase how you perform against them and highlight any areas of improvements. Another point to consider is the amount of data you need to present in your monthly SEO reports. There’s a difference in what you present in a Weekly vs Monthly vs Quarterly SEO reports. Weekly SEO Reporting: In weekly SEO reports you are looking for quick changes that are occurring in your digital marketing efforts. These type of reports are useful for the SEO team as well as the Digital Marketing team to compare overall metrics against all channels. Monthly SEO Reporting: Monthly SEO reports provide the best value. The time frame is long enough to measure SEO changes on Google and Bing, but still granular enough to provide a meaningful moving average. These reports can be used by the SEO team, Digital Marketing Teams as well as the C-Level. Quarterly SEO Reporting: These reports are useful for the SEO team to compare against last year quarters and provides a “big-picture” view. But the most use for Quarterly reports is for the C-Level suite who want to compare quarterly figures to correlate with budget spends. Here at Pagezii we are committed to providing enterprise tools for Search Engine Optimization. 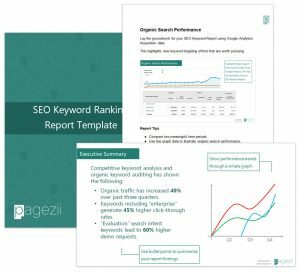 We’ve a collection of SEO Report templates, samples and guides in Word, PDF and PowerPoint format for download. Head over to our Digital Marketing Downloads section to grab our templates.